Improved services now operating. Call 13 12 30 for timetable information. 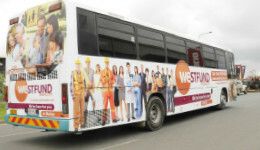 Mackay Transit Coaches, together with TransLink provide quality public transport to the majority of Mackay. On Monday 28 November 2016, your new-look TransLink bus network launched. Using the feedback you provided earlier in July, TransLink worked with Mackay Transit Coaches to design your new bus services. For current timetable information for Mackay and surrounding regions, click here to visit the TransLink website.